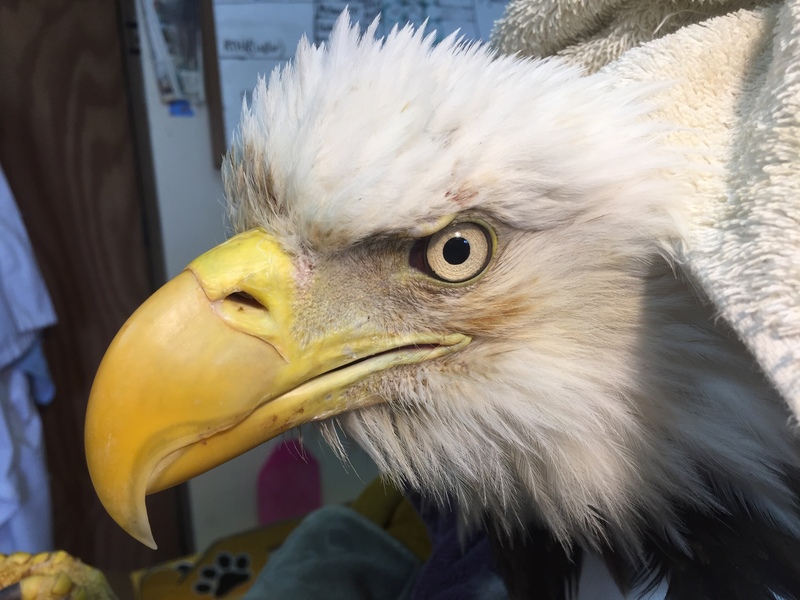 On Monday, March 28th, after three plus weeks of healing time, removing her wing wrap every three days for physical therapy, we took Bald Eagle “Trust”, back to Bennett Creek Animal Hospital for follow-up radiographs and examination by Dr. Debbie Deans. Our hope was that the fractured coracoid bone in her left shoulder was calloused, that is, mostly healed. The news was not encouraging. 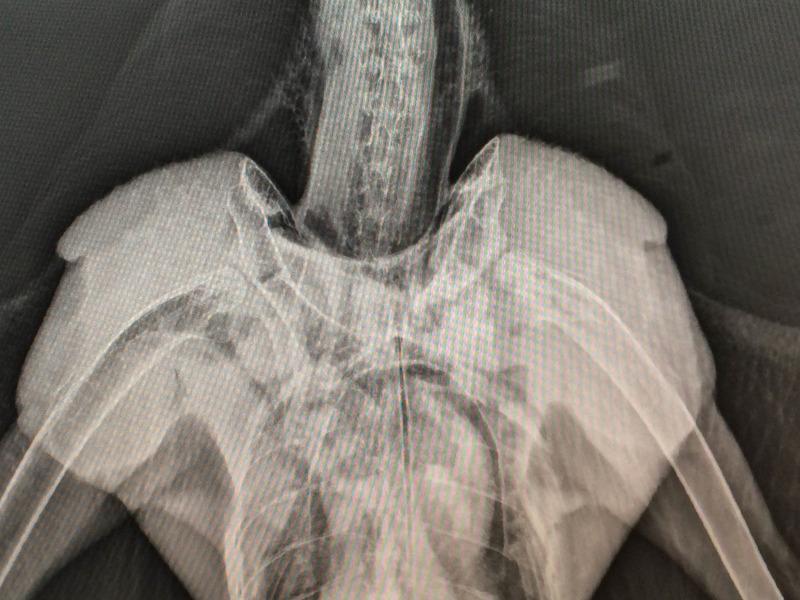 There was still a significant pain response when Trust’s shoulder was manipulated, and it appeared in the radiograph that her coracoid fracture was a “delayed union”, meaning that it was slow in forming a callous and would require more time to heal. The delay was perhaps related to excessive soft tissue damage in the area of the fracture, which would not be visible in a radiograph. Delayed unions generally have a poorer prognosis for return to normal flight and release. 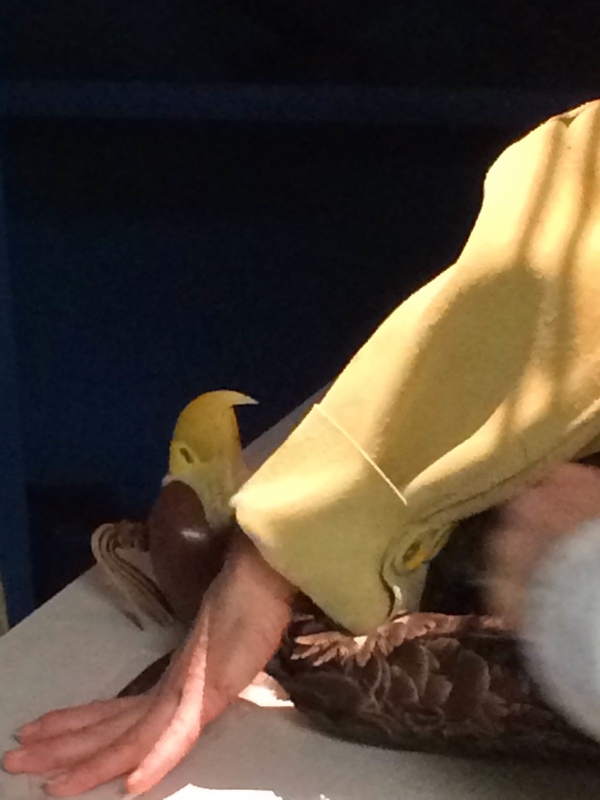 We gathered the advise of several veterinarians (avian specialists) as to how to proceed. The consensus was to re-wrap Trust’s wing, leaving it on for a full week with no physical therapy, to give it extra stability and uninterrupted time to heal. We were advised to then remove the wrap for physical therapy. If she showed no evidence of pain, we could leave it off, and then follow up with another set of radiographs in a few days. Today, April 7th, marked a full week with the wing wrapped and no physical therapy. We removed the wrap and did our usual PT session of flexing the joints and stretching the muscles in Trust’s injured left wing. The moment of truth was when we got to the shoulder and gently moved her wing in small circles around that joint. We were impressed and relieved by how calm she was. There appeared to be no pain response at all. So today I am pleased to announce that we removed Trust’s wing wrap, and left it off! We still can’t say if she will fly normally again or be released, but it appears that her fracture has finally healed. Tonight I even saw her raise her left wing at the injured shoulder, which gives me hope.